President Donald Trump wants to radically overhaul a critical safety net program that covers more than 42 million people — or roughly one in eight Americans. His administration’s budget would slash funding for food stamps by more than $ 213 billion, or nearly 30%, over the next decade. The main way he’d do this is by having the federal government buy and send food to the vast majority of recipients, which officials say they could do for about half the price of doling out cash. The package, called America’s Harvest Box, would be like Blue Apron for poor folks, White House Budget Director Mick Mulvaney said on Monday. Republicans have long wanted to downsize food stamps, known formally as the Supplemental Nutrition Assistance Program, or SNAP. They argue that the program is too large and rife with fraud. Supporters, however, argue that food stamps are an effective benefit that keeps poor Americans from going hungry. They fear Trump’s plan would leave many people without the food they need. There are many misconceptions about food stamps. Here’s how the program actually works. Households must meet three tests to qualify for food stamps. Their gross monthly income must be below 130% of the poverty line, or about $ 26,600 a year for a family of three. Their net income,or their earnings after all deductions have been taken, must be at or below the poverty line. Meanwhile, families without an elderly or disabled person can’t have more than $ 2,250 in assets, while those with such a member may have no more than $ 3,500. How many people receive them? 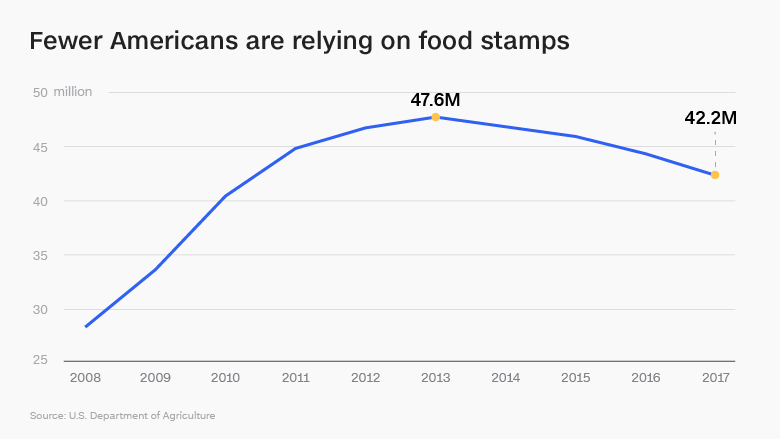 More than 42.2 million Americans participated in the food stamp program last year. After spiking in the wake of the Great Recession, the number has been on the decline for the past four years. Enrollment hit a high of 47.6 million in 2013. As offiscal 2016,44% of food stamp recipients are children, and 12% were senior citizens older than age 60. The rest were working-age adults. Some 57% are female, while 43% are male. Some 36% are non-Hispanic whites, while 26% are black. Another 17% are Hispanic and 3% Asian. The race of 16% of participants is not known. About 11% of are non-elderly Americans with disabilities. What’s the average monthly benefit? A family of three gets about $ 376 a month, on average. They can spend it at one of 260,000 retailers that participate in the program. 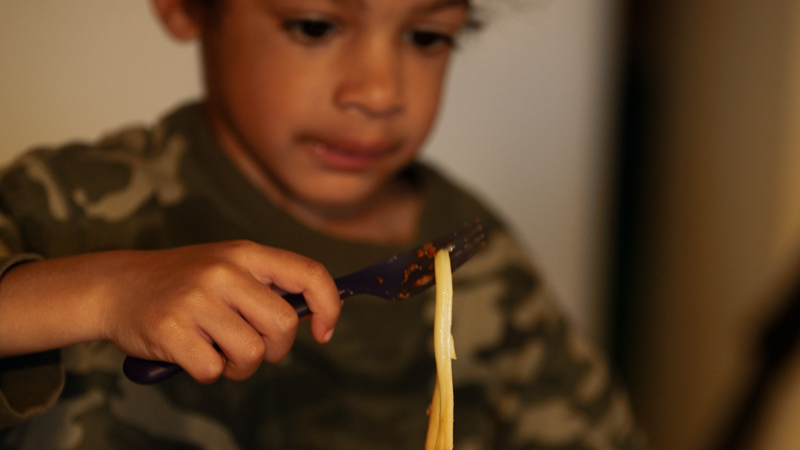 Food stamps often don’t cover an entire month’s worth of food, but the program was always meant to be used as a supplement to a family’s budget. Americans who receive food stamps can purchase a wide variety of groceries, but there are exceptions. Here’s what they can’t get: Alcohol, cigarettes, hot food, pet food, soap and paper products, household supplies or food that will be eaten in the store. How much do food stamps cost? The federal government spent just over $ 68 billion on SNAP last year. More than 93% of the funds goes toward benefits, which enrollees receive on a card, while the rest covers administrative expenses. Are recipients required to work? The food stamp program requires most able-bodied childless adults to work, and in some states, parents must work as well. Adults without minor children can only receive benefits for three months out of every 36-month period, unless they are working or participating in training programs 20 hours a week. States can waive that requirement for areas where unemployment is at least 10% or there is an insufficient number of jobs, as defined by the Department of Labor. The Trump administration’s budget calls for requiring more people to work, in part by limiting states’ use of waivers. Roughly 1.3 centsfor every dollar is lost to fraud, according to a 2013 U.S. Department of Agriculture report. Much of it happens when benefits are exchanged for cash or ineligible items, which typically occurs at smaller retailers.